A former Shirley Chisholm Scholar and political science major, Soribel Feliz has interned at the U.S. State Department and the House Committee on Foreign Affairs. Now she doing her master's to become a U.S. diplomat. 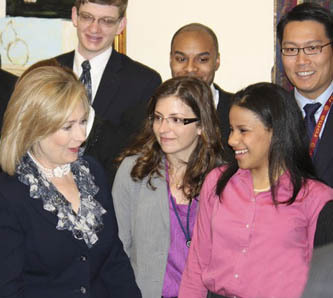 Soribel Feliz (r) got to meet Secretary of State Hillary Clinton when she interned for the House Committee on Foreign Affairs. Given recent world events, these are scary times to be an American diplomat but Soribel Feliz ’09 isn’t deterred. As soon as she completes her graduate studies in economics and public administration at Syracuse University, which she expects to do at the end of this academic year, she will likely be shipping off to some location abroad as a member of the U.S. State Department’s Foreign Service. Feliz, who is currently working toward a master’s degree in economics and public affairs at Syracuse Univerisy, is a Thomas R. Pickering Graduate Foreign Affairs Fellow. The program fast tracks students into the Foreign Service and provides up to $40,000 annually for two years of graduate study. The former Shirley Chisholm Scholar and political science major also scored two internships through her Pickering fellowship—one at the State Department, where she worked on political and intelligence analysis last summer, and another at one of the U.S. embassies abroad, which she will begin next summer. “My first choice would be the U.S. mission to the European Union in Brussels, and my second choice is to go somewhere in Africa,” she says. Feliz, who was raised in the Dominican Republic until age 12, has already traveled to nearly a dozen foreign countries through a combination of study abroad and personal trips and speaks three languages—English, Spanish and French.